I used these framed place cards last year. I couldn't pass up these cute little teeny tiny frames at the dollar store and I bought six of them. I printed each person's name and popped them in the frames. Easy! I made these place cards the year before. I designed them in Word before I knew about PicMonkey. (PicMonkey is so much easier!) I printed them on heavy card stock, colored in the leaves with a fine tip marker, and added a few dots of glue and glitter. Here are the name cards I'm thinking about doing this year. I added a strip of washi tape to the bottom of a blank tag and wrote names on each card for an easy modern look. I used the same tags, but glued on a leaf from the dollar store. 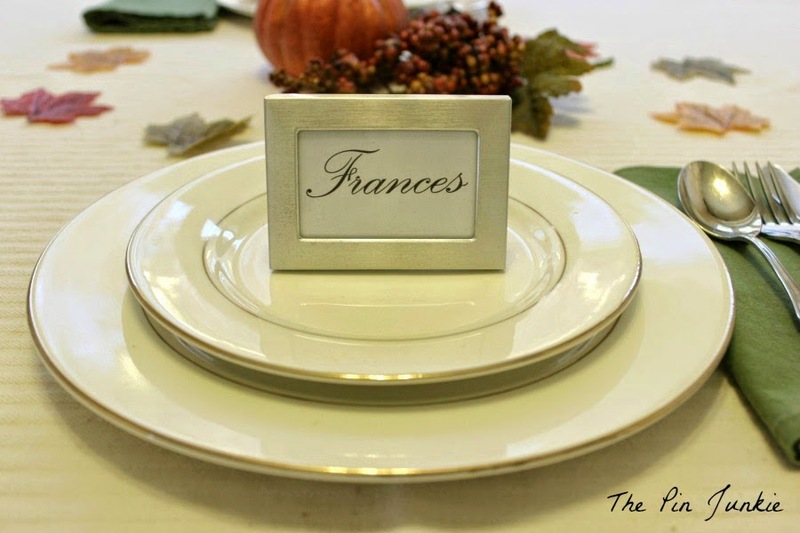 Paint sample cards in fall colors make simple, modern name cards too. 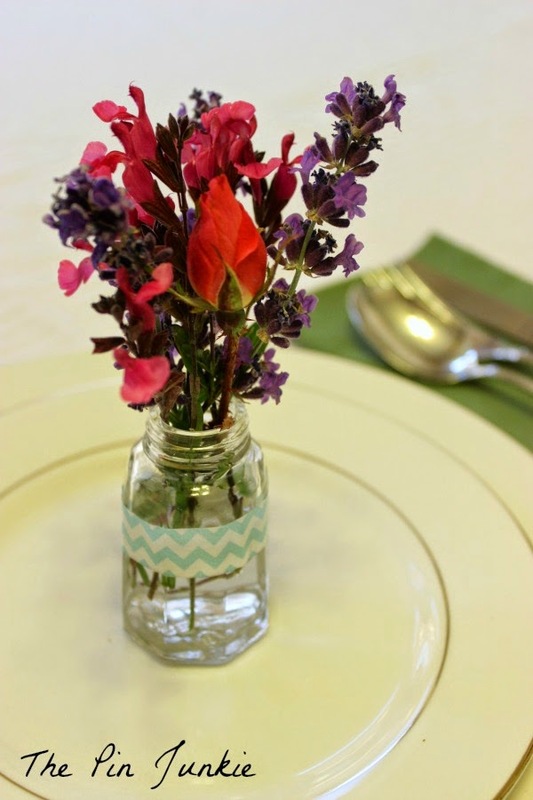 Salt shakers make sweet little bud vases. It's easy to pick up a few sets at the dollar store. I realize these flowers are a bit summery for Thanksgiving. I used what was in my front yard (can you believe I still have flowers blooming in November!) and I would probably use flowers that have traditional fall colors. I wrapped a piece of washi tape around the salt shaker, too. 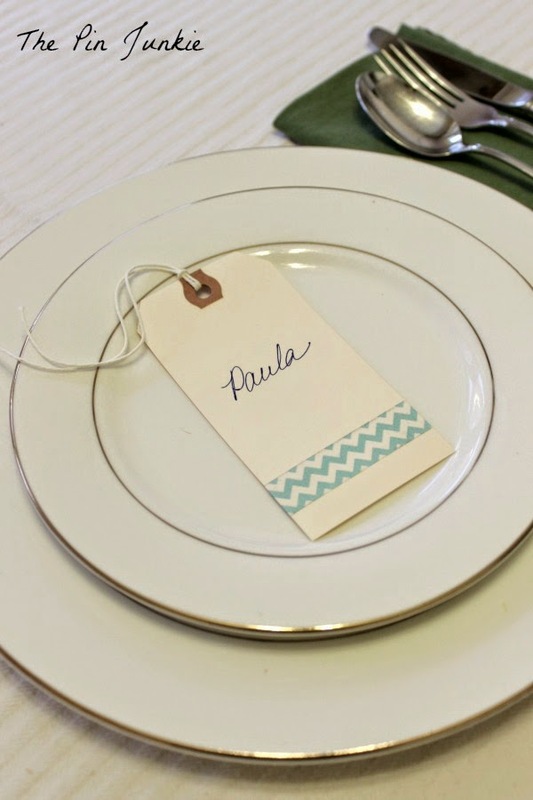 To add a name, just write it on the washi tape before sticking it to the salt shaker. There you go! 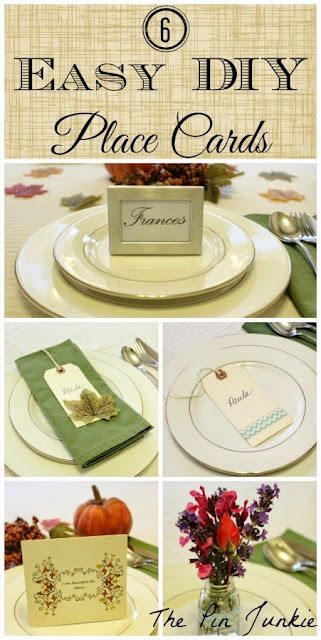 Six easy DIY place card ideas. I'm having a hard time deciding. 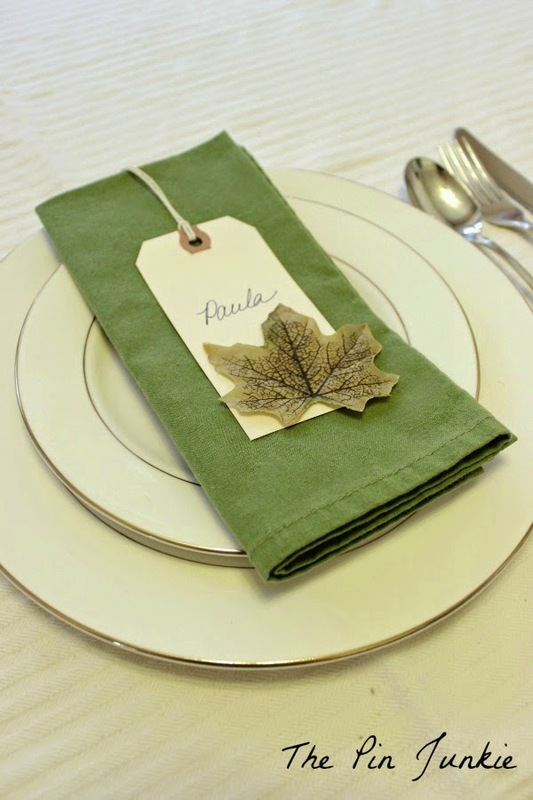 Inspired by these place card pins: leaves, more leaves, and tag. These ideas are wonderful! I'm pinning onto my "party" board. Thanks for sharing! So cute! I love the salt shaker mini-bouquet. Pinning to my party planning board! 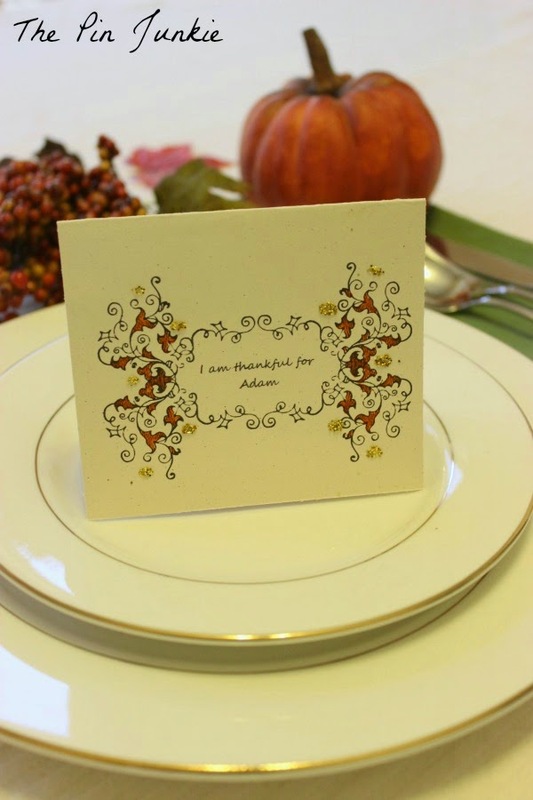 I think that name cards are fun to dress up your Thanksgiving or Christmas table. Thanks for sharing these fun ideas with SYC. Love these place cards. I love entertain dinner at home and these are very helpful. Great place card ideas - thanks for the inspiration! My fave is the tag with leaf on the napkin. Cute idea for tags - I love tags but never can decide what to use them for. This is a keeper idea. Thanks. There is some great inspiration here! Too bad I didn't see this before our Canadian thanksgiving! lol. Thanks for sharing! 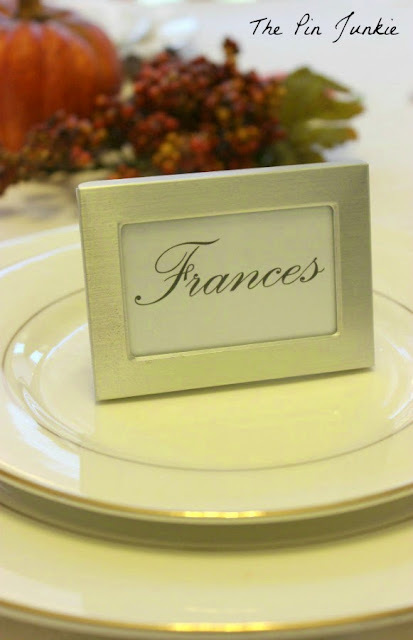 Such a nice bunch of place cards for the table, I especially like the little frame one. Thank you so much for linking up to Wonderful Wed. Blog Hop. I pinned these adorable place cards. I love these ideas! They make the table settings look extra special! Love these, especially the paint chip idea! They would also make great labels for food on the buffet table! I am a new follower! Bonnie, these are adorable! Thanks for sharing at the Retro Re-Pin Party. I like the first framed one best. These are great Bonnie. Featuring when my link party opens up tonight! 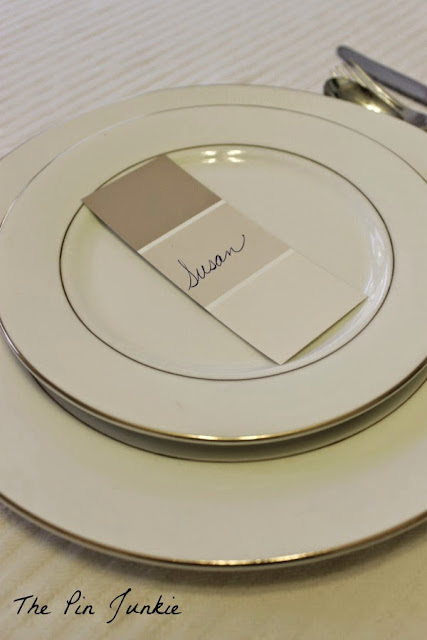 Easy and great place card ideas. Thank you for linking up at Bloggers Brag weekly pinterest party. I have pinned to Bloggers brags pinterest board.We would love to see you again next monday. Gorgeous! Thanks for sharing this to my Thanksgiving Round-Up on Natural and Free. They're great!